It can be funny when people fall down in cartoons and movies – hikers falling in the mountains? Not so funny. We tend to think it won’t happen to us even after reading riveting accounts of accidents in mountaineering literature. Think they only happen to climbers and backcountry skiers? Think again! Sometime it takes an accident to shake the sense of complacency that befalls hikers who have never been injured in the mountains. That was me – I’d been lucky. Between my first hike in 1980 and September 2013 I’d never been injured other than a sprained ankle on my first-ever scramble with The Seattle Mountaineers. Don’t ask me how I managed to sprain my ankle while standing perfectly still on a forested slope but I managed to do it and limped to the summit, determined to bag that peak since it was a “qualifying” scramble to graduate from the Mountaineers Alpine Scramble Course. I’ve also taken a few stumbles landing on my knees (so far no knee problems) never sustaining more than a scratch or a bruise that I didn’t worry about (other than keeping tetanus shots up to date). I’d also taken MOFA (Mountaineering Oriented First Aid class) four times between the mid-1980s and the year 2000 since I was a hike leader. Yet complacency set in; as years pass without injury some of us tend to lighten the load in the pack, especially on a hot summer day on trails close to home and most of the time we get away with it. Hence, my friend Lola and I set out for an easy hike heading south from Snoqualmie Pass on the Pacific Crest Trail. The weather was perfect with partial sun and a breeze. Heading south, the trail traverses below the Snoqualmie Pass ski lifts and in late summer the deserted ski slope was a colorful pastiche of fireweed, goldenrod and tansy. After crossing the ski slope we passed a pretty tarn, always a spot for photography and the dark tarn was aglow with blooming water-lilies. We continued south and after a short descent took the designated spur to Lodge Lake. Lodge Lake is the site of the Mountaineers. The Lodge burned down years ago. No trace remains today. Lodges have a tendency to catch fire – other Mountaineer Lodges have also burned down and, of course, the spectacular lodge that once graced Big Four where the Ice Caves Trail is located today (the Mountain Loop Highway in the North Cascades) only a chimney remains. Back on the trail we skirted more tarns and eventually reached Olallie Meadows which was tinged with fall color, the meadows dotted with tufts of fluttering cotton-grass and ripe berries just waiting to be picked. From there Windy Pass is just a hop, skip and a jump. Windy Pass is a prime berry-picking site as you can drive to it via a rough forest service road to access the PCT (a vehicle with high clearance strongly recommended). After gorging on berries and the eye-candy of mountainous scenes we began retracing our way back to Snoqualmie Pass. That’s when it happened. One moment the forest was green; the next it was red. At first I couldn’t comprehend what had happened but found myself lying on the trail, having taken a face plant on a root, landing on my chin and left hand. There wasn’t even time to curse. Next thing I knew I was in a sitting position, blood running down my left hand and where else I wasn’t sure. Had I broken my teeth again? Falling on my face has been my worst fear since an accident in my teens when I fell near Granite Falls, landing on my jaw in rocks, breaking several teeth (that resulted in years of expensive dental work). This time it was different. My finger felt like it had been diced by a knife and was dripping blood as I clawed at my face, feeling my mouth, trying to figure out whether or not my teeth were OK, unaware I was smearing blood all over my face and that blood was even dripping into my boots. The rest is a blur; Lola bending over me, getting out her first aid kit, my mind a swirl. 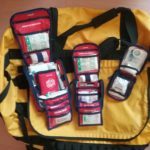 Mixed in with fear and shock was the realization that my first aid kit was pretty minimal, some supplies at home. As I sat there stunned Lola wrapped my finger in gauze; who knew one finger could bleed that much? I bled through the gauze as we started down the trail, still about ½ miles from the turnoff to Lodge Lake. More gauze was applied and I took an Advil from my pack (it is now standard practice that should you come across an injured hiker that you treat the injury from the victim’s first aid kit, not yours – each hiker should carry their own medications including pain pills, OTC or otherwise). As we straggled back to Snoqualmie Pass, I averted my face from other hikers, ashamed of having hurt myself and didn’t want hikers asking about my blood-spattered clothing. I was also angry with myself for being what I considered “clumsy” and not being as well-prepared as I should have been for an unexpected injury. We all know, of course, that accidents happen to other people (yeah, right). As we approached Snoqualmie Pass I saw how the light had changed, gilding the peaks with gold, intensifying the purple and golden colors of the meadows and managed to take a few photos with one hand. At Snoqualmie Pass we went into the convenience store and bought a few first-aid supplies, including OTC pain medications. Lola thought I’d need to get stitches since my finger was still bleeding. I didn’t want to because that would mean going to an emergency room and that would cost money. I vehemently believed I could take care of it at home but Lola insisted that I should at least have the finger looked at. When I got home I called my partner, Bob, about the accident. When Bob came home a he looked at my finger (which was still bleeding) and said I needed to get stitches. So off we went to our local emergency clinic where the physician took one look and said I needed stitches. The details are still blurry though I remember how kind and gentle the physician and her assistant were as they cleaned the wound, gave me a shot to numb the nerves in my fingers and stitched it shut (who knew a hand had so many nerve endings?). The hilarious thought occurred to me that I wouldn’t have to wash dishes for several days (it’s odd the things that come to mind when you are in such a state). They said I’d need to return in 7-10 days to get the stitches removed and was advised not to immerse my hand in water, to clean it daily with an antiseptic ointment and keep it bandaged. As a freelance writer I struggled to finish an article but in a day or two was typing again with 7 fingers, somewhat slower than I was accustomed to. 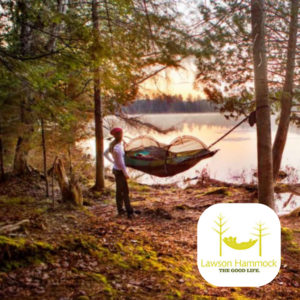 Another curious after-effect from my fall was a sense of vulnerability; a feeling of frailty and lost of trust in my abilities – I knew I had to get back on the trail as soon as possible. Two days after the fall, bandages and all, we hiked at Mount Rainier and I began to re-establish trust in my abilities at the same time keeping in mind that no one is immune to an accident. That’s why they’re called accidents. Fast forward; the stitches were taken out about a month ago. Since the accident we went to REI and bought beefier First Aid Kits in addition to a few extra supplies. The tip of my finger is still partially numb; I may have permanent nerve damage. The laceration was close to the bone and may have severed nerves though Bob insists that I might heal completely over time – the body is in charge and will do what it can to keep it going! 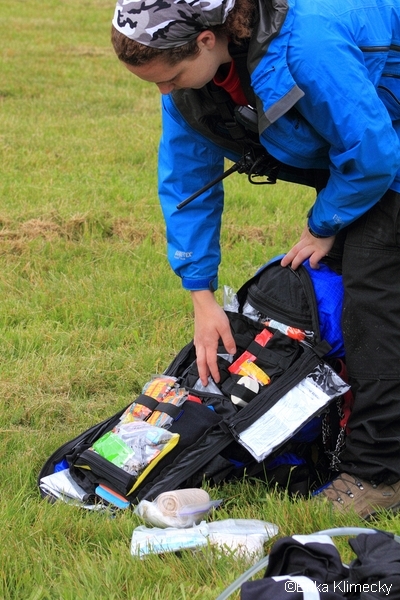 Lesson learned: Keep your First Aid Kit up to date (REI has several kits to choose from). 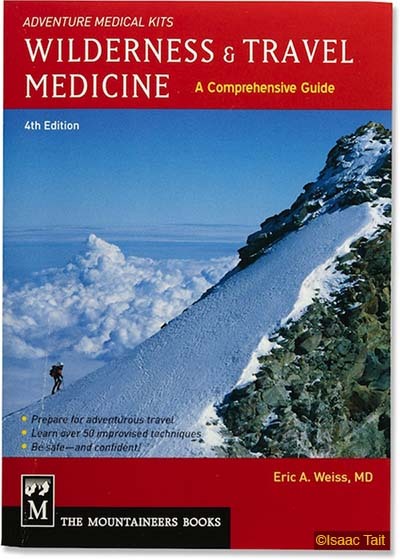 Take a Mountaineering Oriented First Aid (MOFA) Class or equivalent. At the very least be prepared for the unexpected; don’t become complacent. 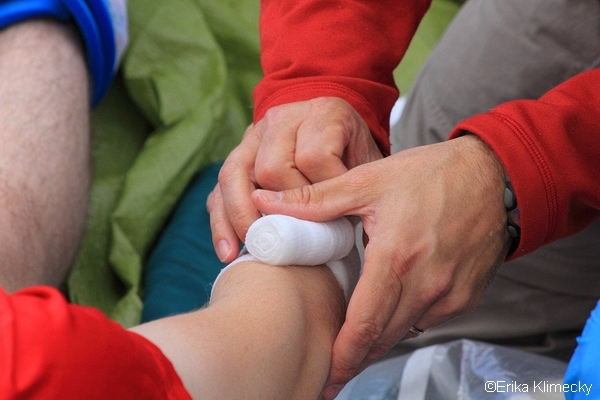 Keep your first-aid kit and skills up to date and be careful out there. Last but not least don’t rely on cell phone coverage in the mountains; think twice about hiking alone and always let someone know where you are going.